This one might seem like a no-brainer, but when you’re woken up in the night and you’re trying to orient yourself to where the bad guy is and what he’s doing; you have to know where your firearm is, and it has to be easily accessible to the adults. You want to make sure that when/if your kiddos crawl in bed with you in the middle of the night, that your firearm is inaccessible to them. If you have an everyday carry gun we recommend that you bring it back to the bedroom with you at night and leave it on a dresser, nightstand (Secured in a safe like the Hornady Rapid RFIF Gun Safe), or shelf that is out of reach of children. Just because you’re trying to save the life of your family, does not mean that you can just leave your firearms out within the reach of children. There is still a level of good parenting and adulting that needs to happen here. If we hear that proverbial bump in the night one of the first things we will do is grab our firearm and call 911. After I dial and connect to 911 I will say something quick and informative like, “Someone’s in my house, I’ve got a firearm, I’m going to get the kids”, then set down the phone (leave it connected) and go get the kids. When I return from getting the kids I will get back on the phone to verify that help is on the way. Nothing sets off a 911 “spidey senses” like a quiet comment that’s whispered, especially when you say that you have a firearm. They don’t know what to expect so they send a lot of resources to help you. This works in your favor! This is possibly the most important thing to plan out and make sure you run through conducting dry practices on. If you’re a parent then you understand how your kids are your world! Naturally, we want to protect them from harm at all costs. That cost is all of these points and practicing getting the kids. I realize I’m making an assumption that your kid’s bedroom is close to yours. If it’s not then I strongly suggest that you take measures in communicating with them about how to barricade themselves in their rooms, install locks from the inside that are emergency only, have an ability to communicate with them quietly rather than yelling and make sure they have their own exit strategy. If their rooms are by yours then it will be significantly easier to grab the kids and go to a safe location like a closet, bathroom, safe room etc. If your hubby is like mine then he is going to “post up” at the end of the hall or another strategic area in between the family and the bad guy(s). Once he posts up, I will work behind him in getting our two kids into our bedroom. We choose our bedroom because it has better stand-off if the bad guy makes it past my husband. When we are first made aware of an emergency I will call 911 and let it sit connected while I go grab the kids. When I get back I will talk to the dispatcher and make sure that help is on its way, as we stated above. This is where you make the stand. You or your husband will be in between you and the bad guys. This is exactly what you want! p.s. 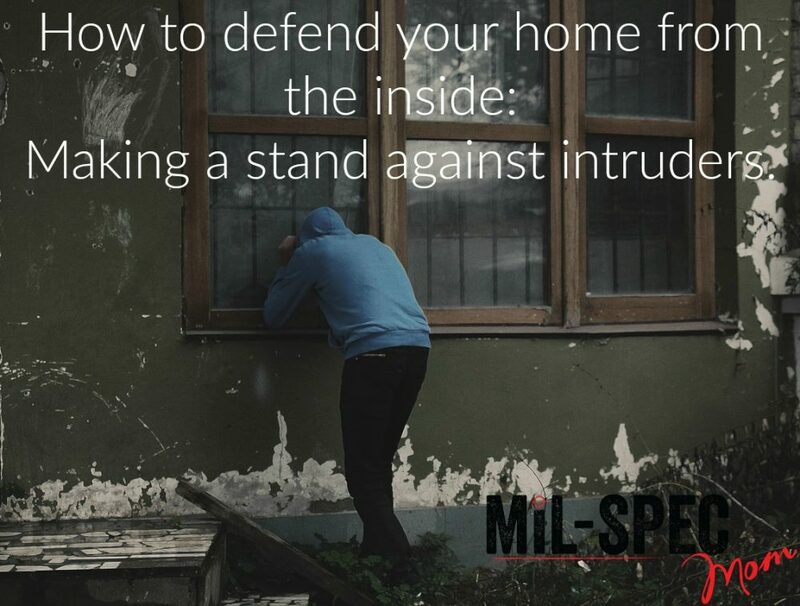 stay tuned for how to handle an intruder if you’re home alone with your kiddos! This post is gold, such great info on home protection! Looking forward to reading more of your blog! Thanks so much Rachael! I appreciate the comment. It’s always best to have a plan!